San Francisco, Calif., and Beijing, China — In 2016, Chinese smartphone giant Xiaomi spearheaded the bezel-less design era with the launch of its Mi MIX product line, igniting overnight global demand for truly full-screen phones. With its top-selling Mi MIX series, Xiaomi is again partnering with Elliptic Labs, provider of the AI virtual proximity sensor software that empowers this trend. INNER BEAUTY® replaces a phone’s traditional IR hardware proximity sensor with state-of-the-art software embedded with machine learning, enabling the removal of space-hogging hardware while simultaneously boosting detection accuracy and enhancing user experience. Phones equipped with INNER BEAUTY III avoid needlessly thick bezels, notches, holes and other intrusions required by hardware optical devices, maximizing the functional area of the screen. Xiaomi’s new Mi MIX 3, which will be launched on October 25, takes full advantage of this technology to create its futuristic, full-screen design with only a thin, reinforcing bezel. 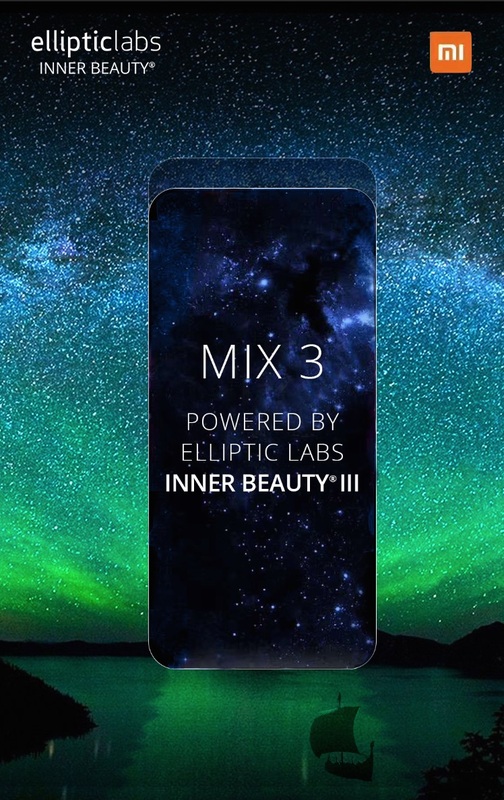 INNER BEAUTY III is just one module in Elliptic Labs’ AI Virtual Smart Sensor Platform, which fuses ultrasound sensor data with standard smartphone data to enhance gesture recognition and enable presence detection for phones. Other modules in the AI Virtual Smart Sensor Platform include INNER REFLECTION™ (a virtual presence sensor) and INNER MAGIC™ (a virtual touchless gesture sensor). INNER BEAUTY is a registered trademark and INNER REFLECTION and INNER MAGIC are trademarks of Elliptic Labs. Other trademarks or service marks belong to their respective owners.